"Made By Athletes, To Support Athletes"
How Purcello And Walk Again Athletic Warriors Are Working Together! PURCELLO is an Italian luxury footwear and accessories brand for men and women that strives to provide elegant, yet trendsetting products for any occasion. Founded in 2016 by the Purcell brothers, Brandon and Stephen, PURCELLO is committed to handcrafting the most elegant products — a union of a bold street style and the highest quality and craftsmanship around. 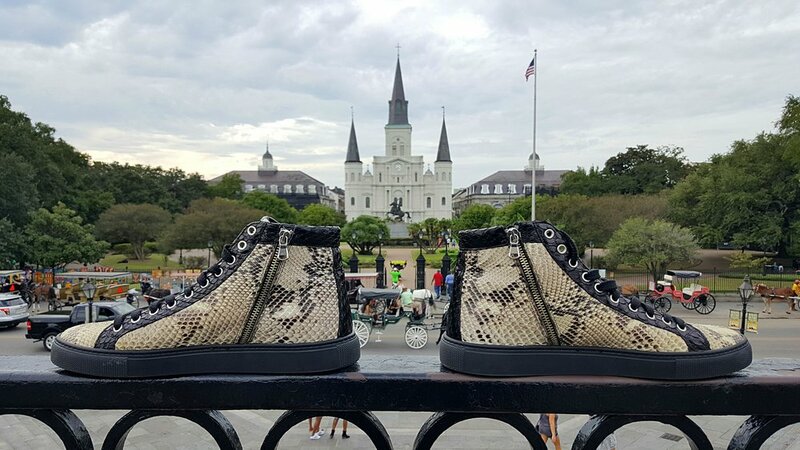 Using the finest exotic skins of genuine python, crocodile, and ostrich, combined with the delicate touch of Italy’s artisans, our products are designed with pure passion so that there’s no more sacrificing comfort for fashion. PURCELLO offers a variety of products from stylish footwear to backpacks, duffle bags, wallets, and belts and every style is hand painted and stitched in a process that takes over 30 hours to carefully manufacture. From creative capsules to charitable collections to unlimited customization, the brand truly thrives through the blend of quality, craftsmanship, innovation, and various aspects of Italy’s remarkable culture. As former Division 1 college football players, Brandon and Stephen founded PURCELLO to make a difference in the lives of others. They are the founders of the national 501(c)(3) approved nonprofit charity, Walk Again Athletic Warriors, that serves spinal cord injured athletes by providing them with the latest advancements in robotic exoskeletons in order to walk again. The Purcell brothers strive to build a brand that can help support an incredible cause, and, thus, with each purchase of any PURCELLO products, a donation will be made and provided to this charity to serve the community for the greater good. Thus, the brand’s mission remains true, to change the way people engage high quality products so that they can look good while doing good. Check out www.purcello.com to view our collections or contact us at customization@purcello.com to set up a personal appointment to design the perfect shoes or accessories with one of our representatives. To see the latest products available, feel free to check out our social media pages: Facebook (PurcelloShoes), Instagram (@purcelloshoes), Twitter (@purcelloshoes), and Snapchat (@purcelloshoes).